Last week my post was about using the Client Push Installation on WORKGROUP systems and this week my post will be a sort of follow-up on that. 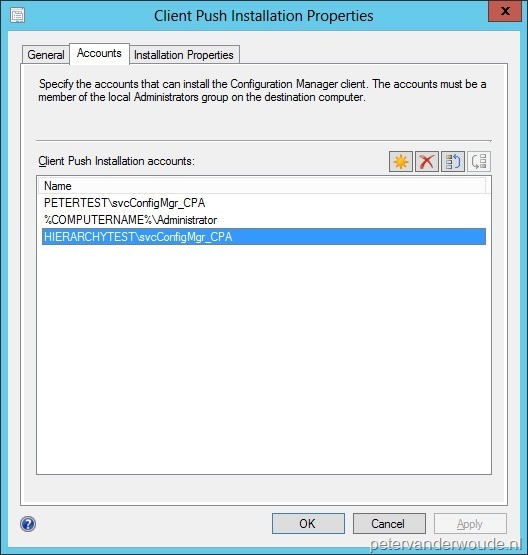 This week my post will be about using the Client Push Installation on UNTRUSTED FOREST systems. The method of last week will also work on UNTRUSTED FOREST systems, but the nice thing about ConfigMgr 2012 is that there are now better options for UNTRUSTED FOREST systems! 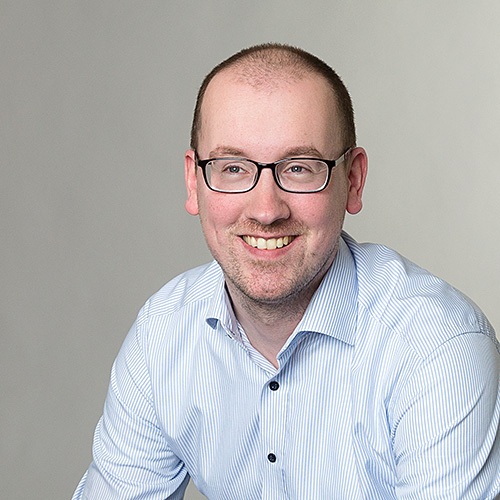 The systems and domain(s) of the UNTRUSTED FOREST can be discovered AND to make it even better, it is even possible to write information to the Active Directory! The FQDN of the Management Point system can be resolved on the UNTRUSTED FOREST systems. The UNTRUSTED FOREST can be resolved on the site server (and domain). The Active Directory of the UNTRUSTED FOREST is extended. The Client Push Installation Account has administrative rights. The UNTRUSTED FOREST is added as an Active Directory Forest. The Active Directory System Discovery is enabled to find the UNTRUSTED FOREST systems. Normally I leave the prerequisites for what they are, but in this case it all stands-or-falls with the configuration of the Active Directory Forest and the Active Directory System Discovery. 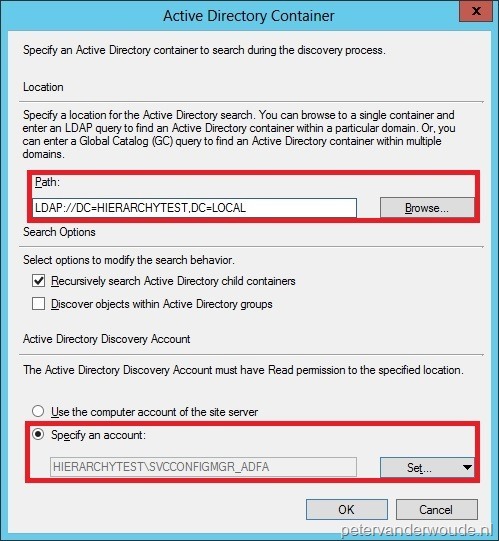 So I will first show in two steps how to pre-configure the Active Directory Forest and the Active Directory System Discovery, before I will show how to configure the Client Push Installation. Navigate to Administration > Overview > Hierarchy Configuration > Active Directory Forests. In the Home tab, click Add Forest and the Add Forest –popup will show. On the General tab, fill in with Domain suffix <aDomainSuffix>, select Use a specific account and Set <aAccount>. Note: <aAccount> needs to have the appropriate security rights to write to the System Management container in the Active Directory of the UNTRUSTED FOREST. On the Publishing tab, select <aSite> and click OK.
Navigate to Administration > Overview > Hierarchy Information > Discovery Methods and select Active Directory System Discovery. In the Home tab, click Properties and the Active Directory System Discovery Properties will show. On the General tab, click <YellowStar> and the Active Directory Container popup will show. Fill in with Path <aLDAPPath>, select Specify an account, Set <aAccount> and click OK. Note: <aAccount> needs to have the appropriate security rights to discover objects in the Active Directory of the UNTRUSTED FOREST. Navigate to Administration > Overview > Site Configuration > Sites and select the site. In the Home tab, click Settings > Client Installation Settings > Client Push Installation and the Client Push Installation Properties will show. On the Accounts tab, click <YellowStar> > New Account and the Windows user Account popup will show. Fill in with User name <DOMAINNAME>\<USERNAME> with the corresponding password in the appropriate fields and click OK.
After the configuration is done it is time to take a look at the results. The best place to look at the results is still the CCM.log, but as I showed that last week already I will now show a snippet of the ccmsetup.log. This log shows that it successfully retrieves information from the Active Directory during the client installation. After the installation was successful the client will show up in the console as an active client with as Domain <DOMAINNAME>. Is this solution supported by microsoft? Great article. The only question i have is… Does the untrusted site need to have the Schema extended? Thanks for the reply. I ask this due to the console complaining that it was not able to create items in the System Management Container. Configuration Manager cannot create the object “cn=SMS-MP-SITECODE-Servername.Domain” in Active Directory (Domain). Then you’ve probably enabled the site to try and write to AD (in the site Properties). 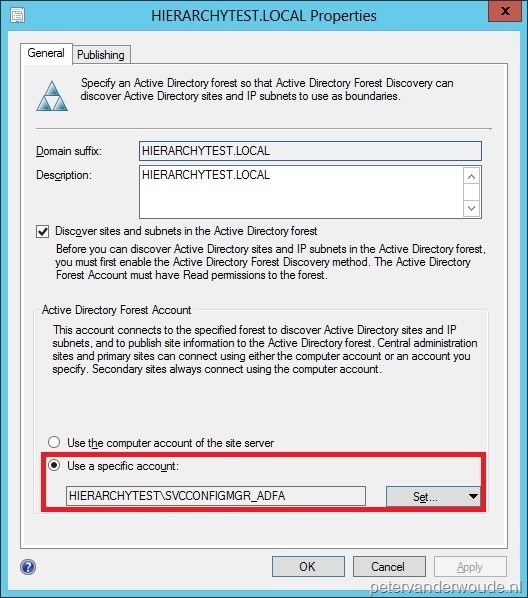 Is the referenced account ‘SVCCONFIGMGR_ADFA’ in the above example an Enterprise admin created at the forest level? if so, how this would have admin rights in the sub-domains? No. That account has just read access in that specific domain, as it’s only used for discoveries in that specific domain. Is the FOREST DISCOVERY actually a requirement which we can not push the clients unless it is there , Or we enable the forest discovery just to do a better job. What I am asking is can we enable the client push to another forest without turning the FOREST discovery , or its not possible ? I could very well be that only the Active Directory discovery is sufficient, but I haven’t tested that. In theory it should try all the account configured for client push in the order listed? Correct. I should go through the client push accounts, one by one. Thank you for these very helpful posts. I am in the middle of setting up a similar scenario, however, we are installing a site system within the untrusted domain to act as the MP, DP and SUP. We are using Configuration Manager 2012 R2 SP1 with a Primary on our internal domain. The primary site server is running Windows 2008 R2 and the CM database is also installed locally. The forest disovery to the untrusted domain is working fine and the devices in the untrusted domain are listed within the Configuration Manager console (we have a one-way trust where the external (DMZ) domain trusts internal). We can resolve hostnames OK between the domains and the schema in the untrusted domain has been extended. Error Description : Login failed. The login is from an untrusted domain and cannot be used with Windows authentication. Would be grateful if you had any suggestions? By default, the MP will connect to the database by using its SYSTEM account. Make sure that you’ve configured a service account for that. Hi Peter, thanks for the reply. I have setup a service account for the MP in the untrusted domain – I did get a suggestion from Paul Winstanley to register the SPN for the SQL Server – so I will attempt this first and see how it goes. Regards. No problem. Please let me know if it eventually fixed the problem. Great article, but I am on the first step. I want to access machines in another forest. 1. How do I get my SCCM server to authenticate machines in another forest. It starts with name resolving. That’s the first step to take. I have followed this article, however the clients are coming back with a grey question mark on them. They are unable to see published applications or software updates. The control panel applet only displays machine policy and user policy in the actions tab. All the rest are missing. Do you know what could be the issue? That sounds like the client is not successfully registered with the site.